I have been told that "X2Pro was ignoring the lane on a spine" (a spine is a secondary storyline in this case) and it has been fixed by the developers, but is still yet to go through QA. I have a hunch that this may not be a problem if v1.5 fcpxmls are used. Have you tried that as a workaround yet? I just had a new program come through where the editor had used lots of secondary storylines for the audio and quite a few did not transfer. I couldn't see why some came thorough and other didn't but is does seem to be an issue. Do let me know if I can help anyway here? We have reproduced the issue and are still looking into it here. I was just wondering if there was any news on this as I have just had another AAF come back with one leg missing on an audio clip and the clips was also in a secondary storyline. Of interest this story line had some audio edits and a fade on the . I have attached a screen grab and the storyline in question is the one where the curser is. Yes in a nut shell its the music track that looses one of the stereo legs. When i took it out of the secondary story line it was OK in the AAF. I guess the editors are using the storylines to keep all the parts of the music track locked together in the event that the primary clip they are attached to is moved. Last Edit: 2 years 2 months ago by angus.anderson. Let me explain what I have seen from looking at your fcpxml and then hopefully you can tell me whether I have understood what you are reporting. All three of these issues can be seen on the clip starting at 00:01:08:22 called ANW1540_09_8-Bit-World. I think the clips that this is happening to are always clips in a secondary storyline that are anchored to clips that are either disabled, or have some tracks turned off (or both), and the clips inside the secondary storyline are inheriting the settings of the clip they they are anchored to. Here are two screen grabs from protools before and after. I believe the only difference was removed the secondary story line (group) from the audio. 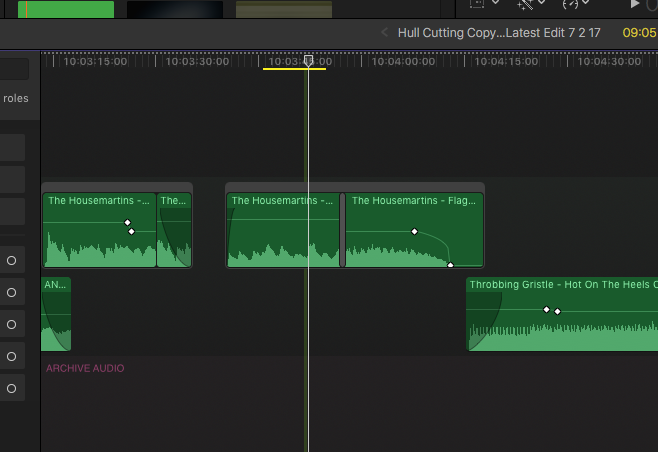 It does seem to be a combination of off speed on the primary and audio being chopped up in the secondary storyline. it would be great if you could send over the fcpxml. I don't think I saw any emails or posts that included it. I think that it may be down to retimes in the primary that are causing this. Do you still want the xml file. Not sure if I sent it over separately ? Our developers can take a look and see if there is anything we can do, but we will need your source clips and FCPXML to reproduce things in our lab. Please let us know if we can get those form you. i have just created another AAF from a different program and had the same thing happen when music files are in a secondary storyline. I think in all cases the music was from the same source file and just had a few cuts in it. It's only on these 2 bits of music track all the rest is OK. Looking at the cut it may have something to do with overlapping secondly storylines? I'll see if I can try and replicate the issue.